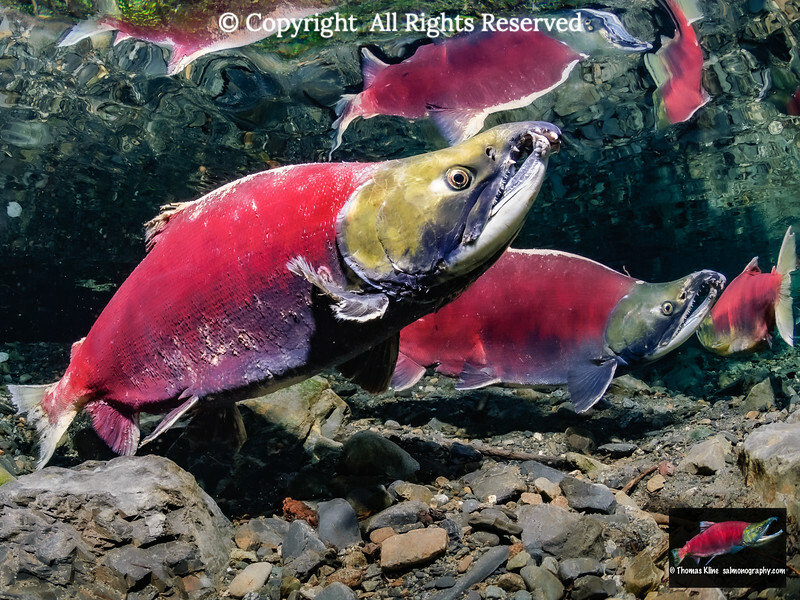 Sockeye Salmon (Oncorhynchus nerka) are also known as Red Salmon. This is the most valuable species to the Alaskan commercial salmon fishery. 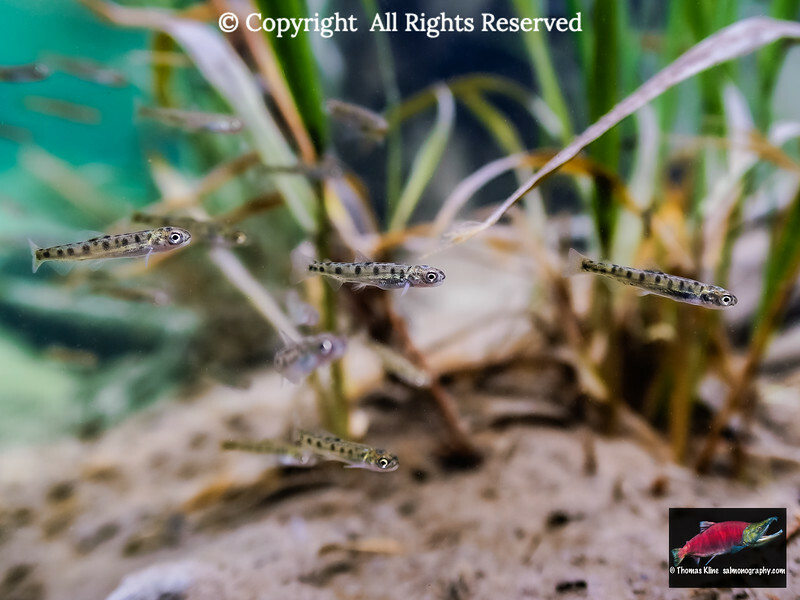 Young Sockeye Salmon mostly feed on freshwater plankton and so live in lake systems for up to three years before smolting. 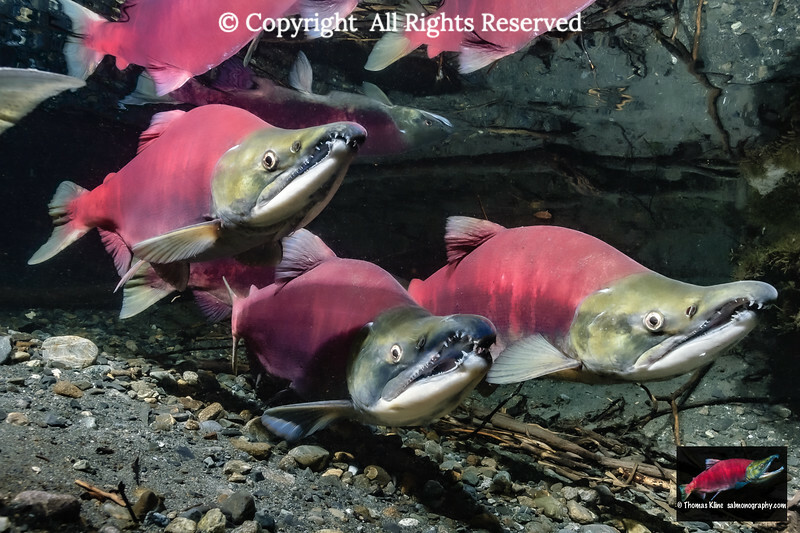 Maturing anadromous Sockeye Salmon will typically have spent two or three winters in the ocean. The latter are referred to as three-ocean fish and are larger than two-ocean fish. Sockeye jacks are much smaller one-ocean fish. Sockeye Salmon (Oncorhynchus nerka) spawning in a tributary of Eyak Lake, Alaska. Aspect Ratio = 1:2. 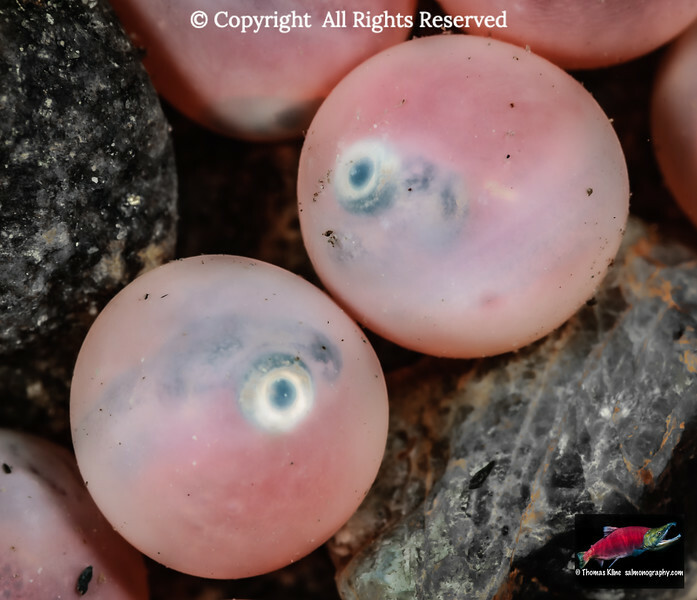 Recently emerged Sockeye Salmon (Oncorhynchus nerka, Salmonidae) fry in Saddlebag Creek, Chugach National Forest, Copper River Delta, South Central Alaska. 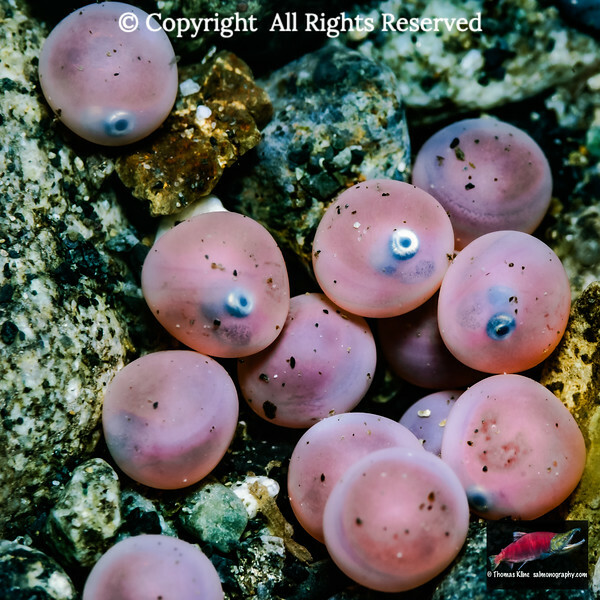 Developing Sockeye Salmon (Oncorhynchus nerka) eggs. A developing embryo with yolk sac is visible inside each egg. Aspect ratio = 1:1. 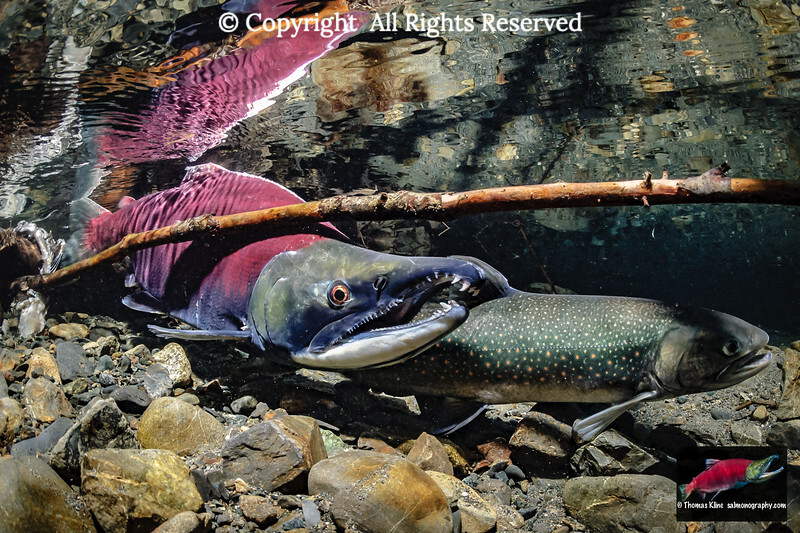 Male Sockeye Salmon (Oncorhynchus nerka) quivering a female Dolly Varden (Salvelinus malma) in a vain attempt to spawn. Aspect ratio = 2:3. 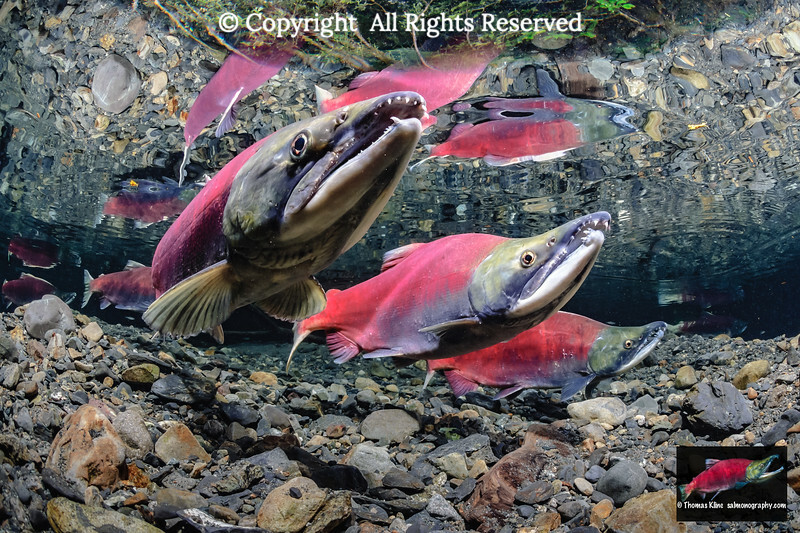 Rival male Sockeye Salmon (Oncorhynchus nerka; Salmonidae) being observed by female of interest. Aspect ratio = 1:2. 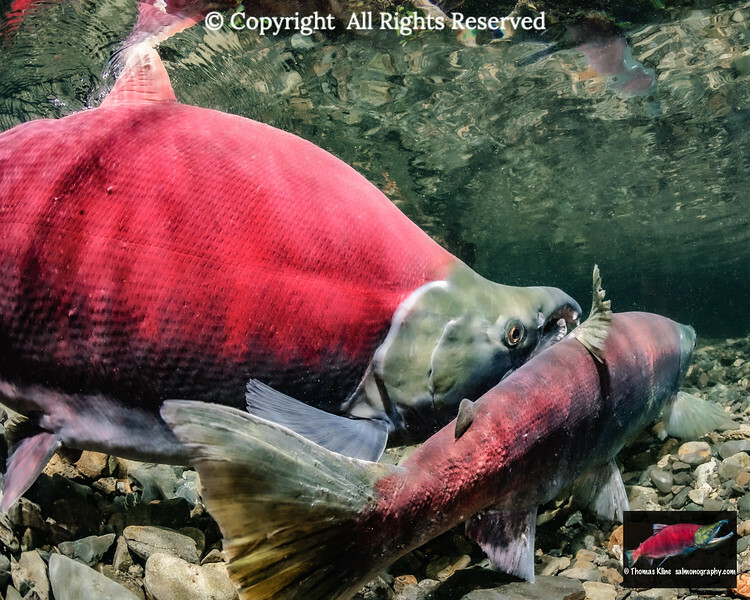 Fighting between these Sockeye Salmon males (Oncorhynchus nerka) has escalated to one biting the oher. Aspect ratio = 2:3. 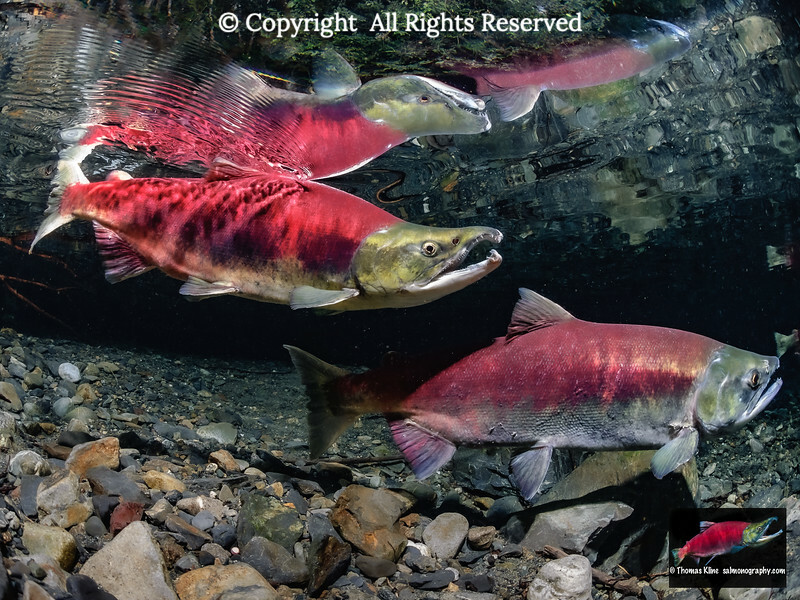 Schooled Sockeye Salmon (Oncorhynchus nerka) arriving on spawning grounds. Male in background is gaping, which is a threat display. Aspect ratio = 2:3. 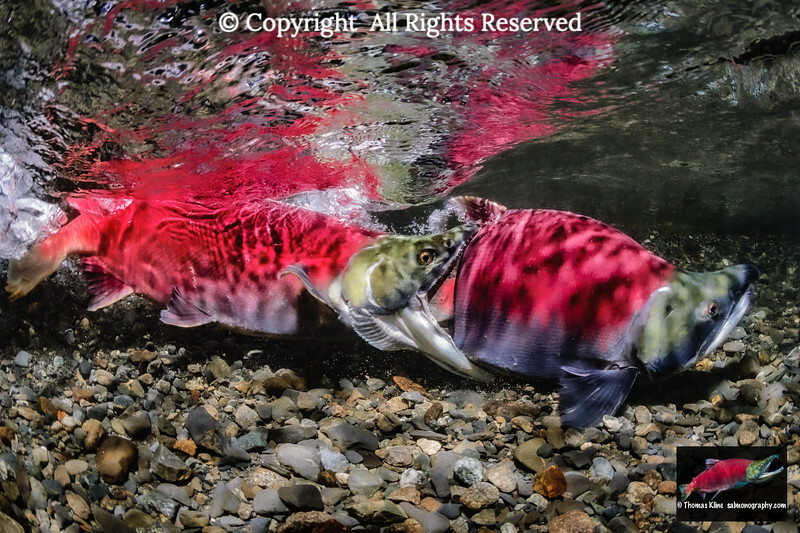 Sockeye Salmon (Oncorhynchus nerka) spawning pair. Aspect Ratio = 4:5. Female Sockeye salmon digs her redd in stream gravel while male guards. 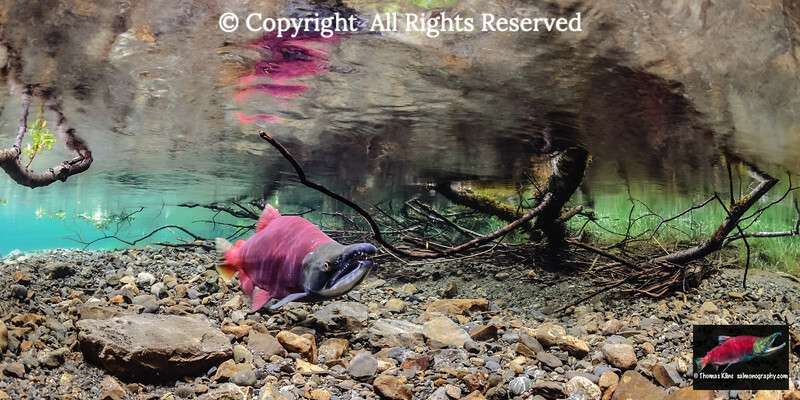 Mature Sockeye Salmon (Oncorhynchus nerka) paired up for spawning in an Alaska, USA stream. Female digs her redd in stream gravel while her alpha male guards. 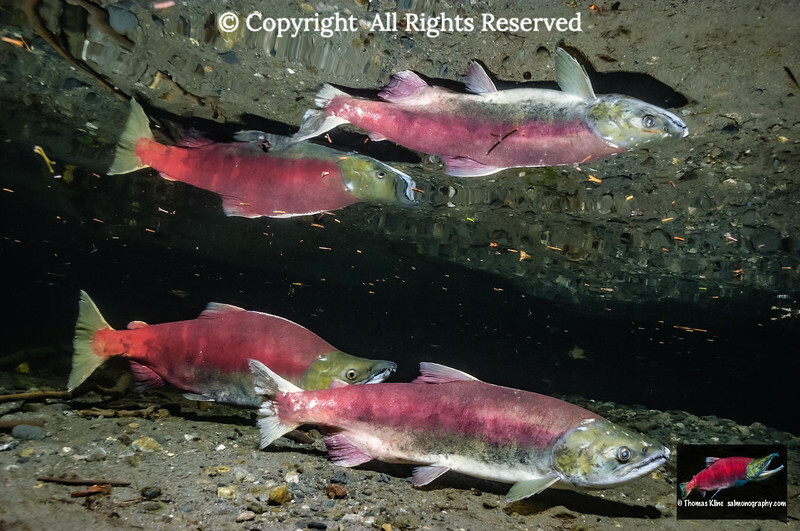 Sockeye Salmon (Oncorhynchus nerka) on spawning grounds. Alpha male’s head is held in a raised position as a threat towards the male on his left. Aspect Ratio = 2:3. 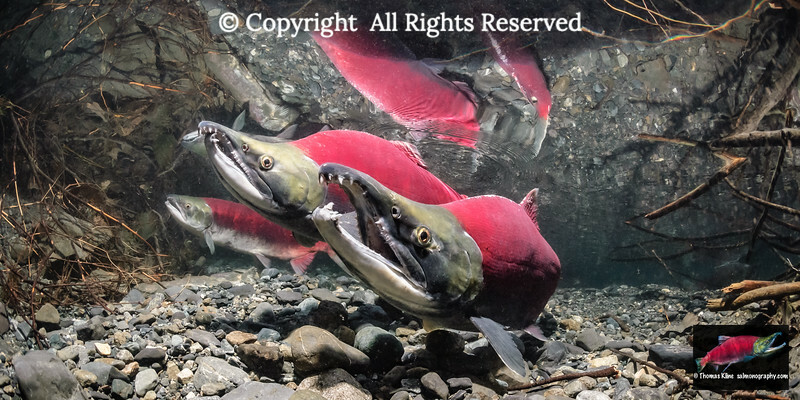 Male Sockeye Salmon (Oncorhynchus nerka) quivering (courtship) a female, which generates surface waves. Aspect Ratio = 3:4. 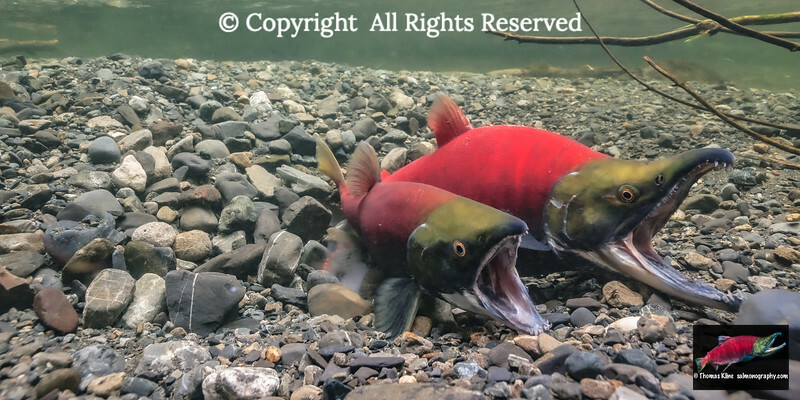 Male Sockeye Salmon (Oncorhynchus nerka) threatening another male by raising his snout. Aspect Ratio = 3:4. 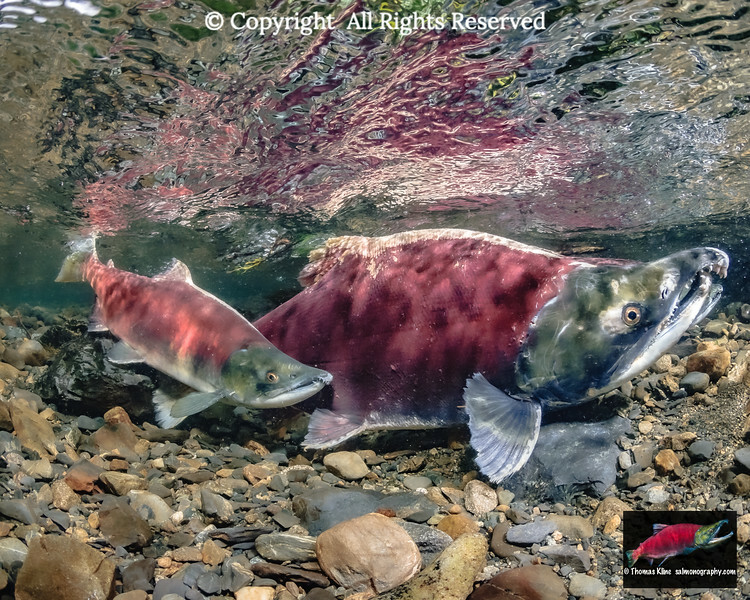 A jack sneaking alongside a normal sized male Sockeye Salmon (Oncorhynchus nerka). Aspect Ratio = 4:5. Sockeye Salmon (Oncorhynchus nerka) male arriving on spawning grounds while salmon fry lurk in weeds. Aspect ratio = 1:2. Gaping, a threat display by a male Sockeye Salmon (Oncorhynchus nerka). Aspect Ratio = 1:2.5. 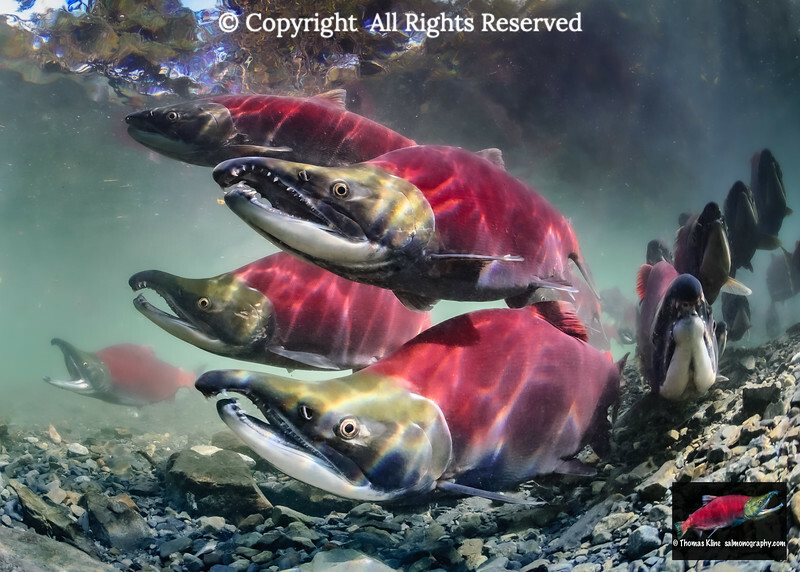 Three mature Sockeye Salmon (Oncorhynchus nerka) males in an Alaska stream. Aspect Ratio = 2:3. 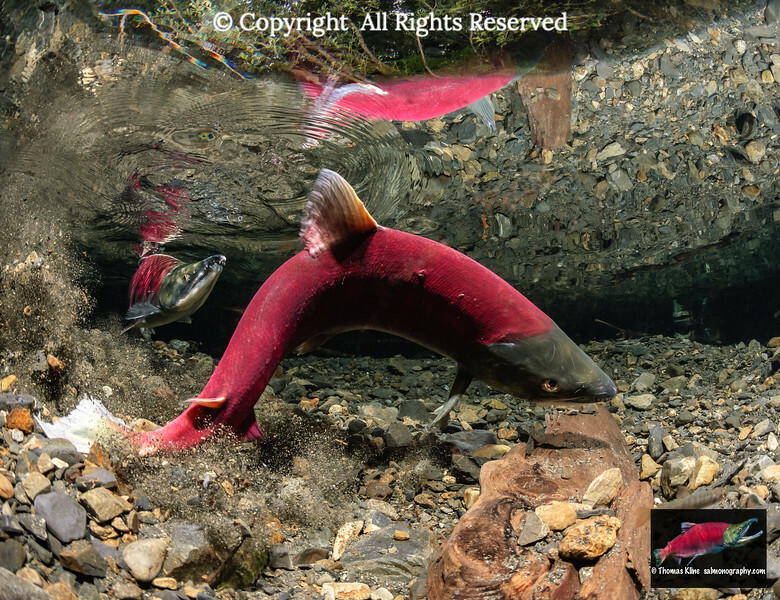 Sockeye salmon spawning pair reflected by a calm surface. Aspect Ratio = 2:3.